A concrete wall requires a firm foundation, called a “footer”, that must be set up before the concrete block is installed. Concrete block can be installed using a dry stack or mortared method of installation. Although a bit detailed, it can be installed by anyone with a little knowledge and a few special tools. Position stakes by driving the stakes into the ground with a hammer at the outside of each corner location for the wall. Tie a mason’s line to each stake and use a builder’s square or the 2-3-5 method to ensure the corners are square. The 2-3-5 method is to measure the mason’s line 2-feet out from the stake on one side of the corner, 3-feet out from the stake on the other side and the distance when measured from mark to mark will be 5-feet if the corner is square. Use a shovel and a rake to dig a trench as deep as your local frost line, add twice the width of the block and add 6 inches for gravel. Dig the trench the width of twice the block and add two inches to allow room to install the forms. Place a level on the bottom of the soil as you dig each section to ensure the bottom of the trench is level. Tamp the bottom of the trench with a hand tamper. Lift and drop the tamper to compact the soil in the bottom of the trench. Add 6 inches of crushed stone in 2-inch layers and tamp after the addition of each layer. Cut plywood sections that are as wide as the twice the width of the concrete blocks with a circular or hand saw. Attach stakes to the plywood sections by drilling screws through the plywood and into the stakes so the tops of the stakes are below the edge of the plywood. Install the plywood and stakes (form walls) with the stakes using a hammer to drive in the stakes on the outside on one side of the trench so the tops of the form walls are 6-inches below the frost line. Make sure the side of each form section is tight to the side of the previously installed form section. Insert a stake at each seam to keep the edges from pushing out when the concrete is poured into the trench. Use a level along the tops of each section to be sure the top of each section is level. Position the form walls on the other side of the trench maintaining the distance between walls at twice the width of the chosen concrete blocks. Use a hammer to drive the stakes into the ground. Keep the sections tight together and insert a stake behind each seam Use a level placed across the walls to be sure the second form wall is level to the first form wall. Spray the inside of the form walls with concrete release agent. Install rebar so it is 1/3 up from the bottom of the trench by placing small blocks of 2-by-4 lumber under the rebar. Space the blocks so there are only 3 or 4 under each piece of rebar. Mix concrete according to package directions or have it delivered. Start from one corner and fill the trench with concrete. Place a 2-by-4 across the tops of the form walls and use it to pull the concrete level. Fill in shallow spots as needed and continue this process along the entire form. If installing the concrete wall using the dry stack method, insert a piece of rebar vertically every 4-feet and both sides of all openings. Cover the footer with heavy plastic and allow the footer to cure for three to four days. Remove the plastic and concrete forms. Insert a stake at each corner that is taller than the height of the concrete blocks chosen for the wall where the outside of the placed concrete blocks will be located. Tie a mason’s line to each corner. Use a line level to ensure that the mason’s line is level. Install the corner block on each corner. The corner blocks are the most important block of the entire project; accuracy is crucial. Align the side of the corner block to the mason’s line. Place approximately ½-inch of mortar where the edges of the block will be when the block is in position. Use a level to check that the block is level both ways as well as plumb. If it is level both ways, it should be plumb on both sides. Adjust the line as needed so the line is just touching the top of the concrete block and re-level the mason’s line with the string level. Install each block on the first course to be level with the first block. Place approximately ½-inch of mortar under each block in the same manner as the corner block. Align each block so it touches the mason’s string; check that the block is level and plumb in all directions. Dry stack each subsequent course. Offset each course by one half of a block. 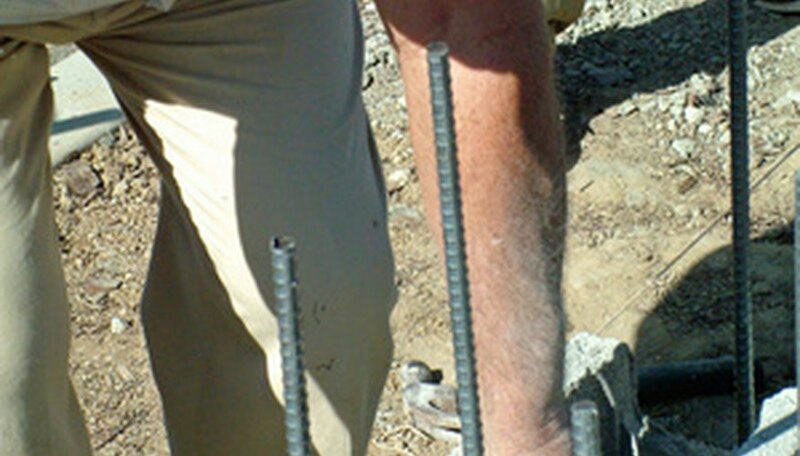 When a block is positioned over rebar, fill the cavity containing the rebar with concrete. If the wall is higher than the rebar installed in the footer, add more rebar as needed. Parge coat the concrete block wall with fiber-reinforced surface bonding cement. Wet the wall and apply a 1/8-inch coat with a mason’s trowel on the entire wall surface. Install two or three blocks in each direction by placing mortar on the footer, laying the block, checking for level and plumb. Place a 3/8-inch layer of mortar on the edge of each block prior to installing the next block. Repeat for each corner and then continue to fill in the walls between corners. Work from the corner for each subsequent course of concrete block. Apply mortar, check for plumb and level and offset each course by one-half of a concrete block. Tie mason’s lines to bricks, stretch across each layer of block, and align the top of each block with the mason’s string stretched between the corner blocks. There should always be two or three levels higher at the corners than the centers of the walls until the completion of each wall. Monitor the accuracy of the corner blocks by placing a level on an angle touching each corner of the rows of blocks. Make adjustments in mortar thickness between blocks to correct any course that is not touching the level or sticking too far out. Cut blocks as needed with a wide chisel and mason's hammer as needed. Do not mix more mortar than you can use in an hour or hour and a half. Wear safety glasses or goggles when cutting concrete blocks to protect your eyes.